The plan made me feel dishonest and creepy, so it took me a long time to send my novel out under a man’s name. But each time I read a study about unconscious bias, I got a little closer to trying it. I set up a new e-mail address under a name—let’s say it was George Leyer, though it wasn’t—and left it empty. Weeks went by without word from the agents who had my work. I read another study about how people rate job applicants they believe are female and how much better they like those they believe are male. The thing I was thinking of doing was absolutely against the rules, the opposite of all the advice writers get, but I wasn’t feeling like a writer, and I hadn’t written in weeks. Until last winter, I had never faced a serious bout of writer’s block or any meaningful unwillingness to work. A blank page had always felt to me like the moment the lights go down in a theater—until the day it didn’t. I was spending more time crying on the phone than writing and I had no idea how to get back to work. Every paragraph was a negotiation—my instinct leading one way, and then a blast against it—don’t do that, you’ll confuse people. No one wants to read that kind of thing. So, on a dim Saturday morning, I copy-pasted my cover letter and the opening pages of my novel from my regular e-mail into George’s account. I put in the address of one of the agents I’d intended to query under my own name. I didn’t expect to hear back for a few weeks, if at all. It would only be a few queries and then I’d close out my experiment. I began preparing another query, checking the submission requirements on the agency web site. When I clicked back, there was already a new message, the first one in the empty inbox. Mr. Leyer. Delighted. Excited. Please send the manuscript. Almost all publishers only accept submissions through agents, so they are essential gatekeepers for anyone trying to sell a book in the traditional market rather than self-publishing. There are various ways of attracting an agent’s attention, but sending query letters is the most accessible. The letter describes the novel, the author, and usually includes the first pages of the manuscript itself—the equivalent of what a reader might see picking up a book in a store. Agents can let silence speak for itself, write back with a rejection, or ask to see the novel. This was my second time going. I had written a novel before, and sent it around. Those queries had a pretty good response, though no one offered to represent it. All the agents who read it said it wasn’t bad, but that it had an essential structural problem. I couldn’t fix it, so I put it away. My short stories had also usually gotten some decent replies—some published, most rejected with a detailed “please send more” kind of answer. I figured that I was paying my dues, keeping on keeping on, having roughly the same experience any other young writer would have. Sometimes it was hard to put away something I had believed in. But in general, I believed what I was told about my work. This new book was different. I knew it was better than my older work—more ambitious, more interesting, more playful, more exciting. My writer friends loved it and sent it to their agents on my behalf, before I began sending query letters under any name at all. The responses trickled back with a number of similar rejections, mostly: “beautiful writing, but your main character isn’t very plucky, is she?” and of course, a lot of silence. Still hopeful, I started sending blind queries, hoping for at least a few enthusiastic readers. Meaningless silence turned into meaningful silence day by day. The few written rejections didn’t cite a coherent problem. My writer friends still promised it was a good book, that I should have faith in my work, that good news would be around the corner. It wasn’t. Being rejected is par for the writer’s course. But what chilled me was the possibility that it was not a surface problem but an astigmatism in my understanding of human nature—that I’d written something better but somehow less meaningful, that I could make nice sentences, but what I think people do is not what people do. Every rejection letter mentioned the “beautiful writing,” which is the paint job on top of but not the engine of the book. I started writing short and angry paragraphs, and then not writing at all. The problem reached into every part of my mind—not only that I had written the wrong book, but that I was the wrong person. That was when George came to life. I imagined him as a sort of reptilian Michael Fassbender-looking guy, drinking whiskey and walking around train yards at night while I did the work. Most of the agents only heard from one or the other of us, but I did overlap a little. One who sent me a form rejection as Catherine not only wanted to read George’s book, but instead of rejecting it asked if he could send it along to a more senior agent. Even George’s rejections were polite and warm on a level that would have meant everything to me, except that they weren’t to the real me. George’s work was “clever,” it’s “well-constructed” and “exciting.” No one mentioned his sentences being lyrical or whether his main characters were feisty. A few of people sent deeply generous and thoughtful critiques, which made me both grateful and queasy for my dishonesty. No one person is responsible for the larger effect of the group response to my work, and presumably none of them want to be sexist. I emerged from this experiment with a few theories about the emergent gulf. Third: with my name, maybe my novel was taken for “Women’s Fiction”—a dislikable name for a respectable genre—but not what I was writing. If an agent was expecting that, I’m not surprised he or she would turn away after the first page or two. 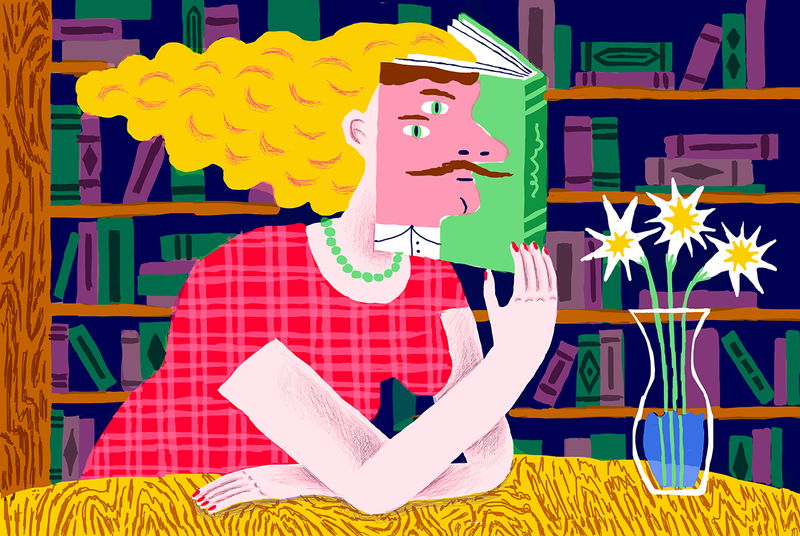 A George wasn’t expected to be writing Women’s Fiction, so he was taken on his own terms. Last, maybe the agents were subconsciously friendlier to George. Unconscious bias is difficult to overcome. Once I met an agent face to face, and we discussed the first 20 pages of the novel. He said it was good, but it was so ambitious he doubted that I would be able to pull off the whole book at that level, so he would have given it a form rejection if it had come through the mail. The difference could be in the gut assessment of how likely a George is to pull off something ambitious. To some degree, I was being conditioned like a lab animal against ambition. My book was getting at least a few of those rejections because it was big, not because it was bad. George, I imagine, would have been getting his “clever”s all along and would be writing something enormous now. In theory, the results of my experiment are vindicating, but I feel furious at having spent so much time in that ridiculous little cage, where so many people with the wrong kind of name are burning out their energy and intelligence. My name—Catherine—sounds as white and as relatively authoritative as any distinctly feminine name could, so I can only assume that changing other ethnic and class markers would have even more striking effects. Whenever VIDA numbers come out counting how many men and how many women write for literary publications and people discuss discrimination in publishing—do women pitch less frequently? Are they more easily discouraged? Are they less daring, more eager to be liked, care less about speaking truth to power? Do they prefer small topics and small templates?—I’ve started to think that some large number of these women must be drummed out and bamboozled before they reach their mature work. The pieces about VIDA counts often focus on the way established authors are treated. In Bad Feminist, Roxane Gay writes about the way women are sidelined at the highest levels—“where Jonathan Franzen lost the Pulitzer rather than Jennifer Egan winning the award.” In the “Second Shelf” Meg Wolitzer mentions the generation of august writers that came of age in a period of expanding interest in the stories of women’s lives—she lists Toni Morrison, Joyce Carol Oates, Margaret Atwood, Doris Lessing, Marilynne Robinson. During the apprenticeship phase of their careers, the larger culture was ready to see them as important, authoritative, and they were. There’s a fundamental change in how I look at my work now, how I look at the novel I already wrote and the one that I’m working on now. I quit sending out queries entirely, and used the critiques that George got to improve the book—a book I would have put away in frustration long ago if I hadn’t tried my experiment. The edited draft went to the agent who now represents me, after she got in touch about a nonfiction piece I had written under my own name. Patience, faith, playing by the rules—the conventional wisdom would never have brought me here.